Making maps from digital data has become a key outcome of the democratization of data and the use of the internet to store and share. Ad to that the availability of a wide range of digital mapping tools from full-scale professional GIS, through high-end illustration packages to open source offerings and new players offering ways to build maps through coded solutions. Each to their own but there’s a rich suite of products to suit tastes and abilities. A number of people have played with flight data from openflight.org but here, Aaron Koblin goes that extra mile to create a range of different products. 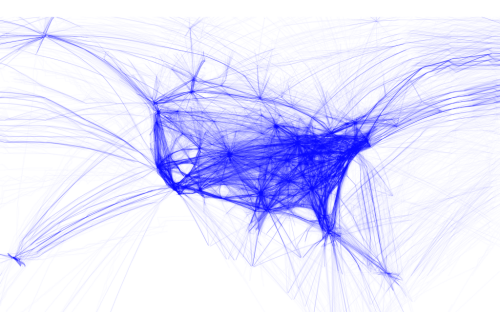 He used the Processing language to convert origins and destinations to geodectic curves to show all commercial flights routes between paired airports. 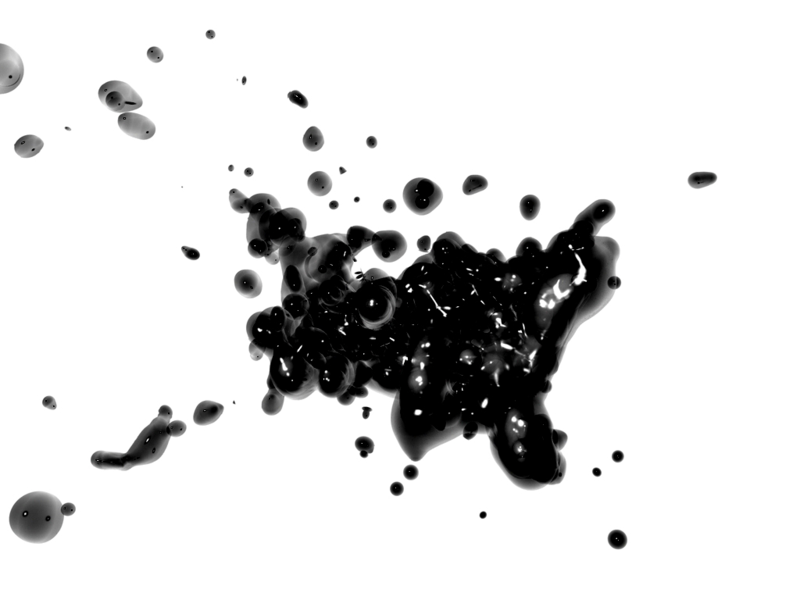 His products are relatively simple…perhaps more data art than map but certainly their end appearance is map-like and they portray spatial relationships. He has created a number of alternatives that show all routes or which classify them by colour based on make or model of aircraft. He’s extracting the detail in the data and working with them in map form. His maps aren’t just static though. There are zoomable slippy maps that show the work in greater detail, overcoming one of the limitations of digital map design that means we have a constrained format. The ability to use multiple scales means we can design across a range of scales despite the dimensions of the viewing mechanism being relatively constrictive. Finally, he turns the relatively easily understood linear representations into animations and more artistic forms such as the blobular version. Of course, this perhaps ventures a little far from a form that allows people to interpret the data but it’s bringing new approaches to the cartographic aesthetic. Experimentation with form is useful. It perhaps doesn’t always carry a function other than to look appealing but beautiful data art is pleasing cartography all the same. 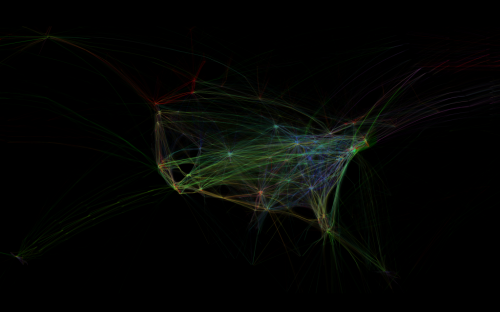 You can see more of Koblin’s flight patterns here and here. Making maps is all about taking a dataset and making something meaningful from it – something that communicates a finding or a result, or something that speaks to an issue or an emotion. In our democratised mapping world, more people than ever are taking interesting datasets and attempting to produce something map-like. All too often the results leave us frustrated but every now and then a perfect storm creates something magical. 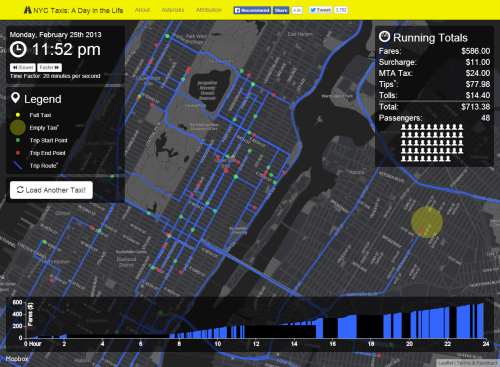 Using a detailed dataset of how Manhattan’s population occupies space during their at home and at work phases of the day, Joey Cherdarchuk could have just plotted it using a standard technique. That wasn’t enough. Using the shape of Manhattan as an inspiration he envisaged a lung…a breathing lung that inhaled and exhaled according to the time of day. The data is animated as the map remains static so we get a breathing city and a breathing map. Adding a simple line graph that mimics a cardiograph monitor simply tops off the combination of visuals, metaphor and thinking that makes this map something special. Using a black background and simple text components frames the work well. 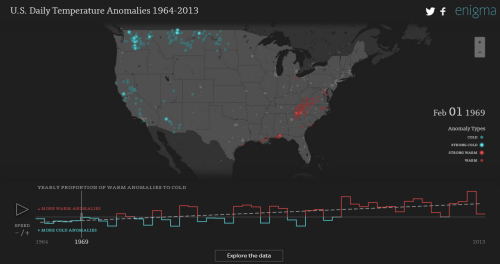 The data is unremarkable…but the map produced makes it intriguing and brings it to life. Details of how Cherdarchuk constructed it are on his blog here. Interactive maps that invite you to explore a big dataset can be intriguing but all to often they fail simply because they are data dumps with little thought to the user needs. Here, the ways in which over 170 million taxi trips connect the City of New York in a given year is the data set. This map provides a unique insight into the inner workings of the city from the unique perspective of the taxi system with a high level of granularity. HubCab allows users to investigate exactly how and when taxis pick up or drop off individuals and to identify zones of condensed pickup and dropoff activities. It allows you to navigate to the places where your taxi trips start and end and to discover how many other people in your area follow the same travel patterns. 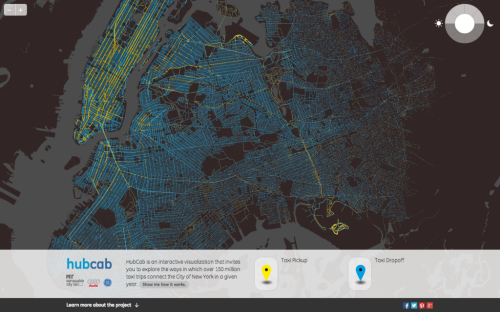 The map can be used to allow an exploitation of collective mobility, patterns of sharing and the authors hope it might be the first step in building a more efficient and cheaper taxi service. The cartography is clean with simple line work on a dark basemap but it’s the interaction and animations that are particularly well constructed. A good example of exploratory cartography to support exploitation of a large dataset. Click the image to launch the web site and app. Cartographic research provides fertile ground for people to conjure up new and impressive work. Such work is largely experimental by design and can take advantage of relatively unrestricted objectives. A lot of research also benefits from being part of a live exhibition where space and format give people a way of exploring interesting new concepts. In some respects, this type of work may be thought of as the equivalent to Formula 1 motor racing in the sense that the investment in one-off technologies provides both a spectacle but also advances engineering that eventually trickles down to the family car. Cartographic experimentation often plays with format and design in a way that we subsequently begin to see in everyday work. 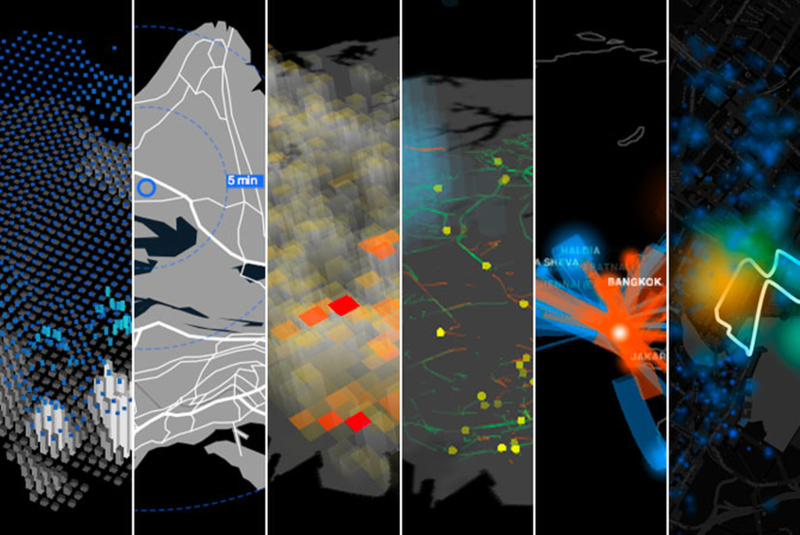 MIT’s senseable city lab are masters of cartographic experimentation. Their LIVE Singapore! series has developed an ecosystem of maps and feeds of information about the city. Their 2011 examples created six different visualizations from six different streams of data about the city. They each showcase a particular theme of relevance to Singapore that is dynamic and immersive and based on monitoring the real-time city through a network of cameras, communication devices and sensors. Of course, the maps they produce are also revealing and communicative. The video below illustrates the 2011 examples and a little of how the examples were seen by visitors to the actual exhibition itself. What the exhibition initiated was a way to explore the mapping of live data streams as a way to track the pulse of the city. Key to this, cartographicaly, is the use of animation of the map…and animation of the symbology on the map. Moving maps can be quite disorienting and there’s no doubt that it’s difficult to isolate and interpret a specific moment but much like a film, you’re expected to consider the whole story; perhaps recalling some of the main events (peaks, troughs, highlights). These maps begin with fairly standard ways of representation but they bring an added dimension to them as techniques through experimentation. We already see evidence of this in maps produced now, some 5 years later. You can see more of LIVE Singapore! on the web site here.